The United States is committed to its mission of establishing and maintaining lasting and trustworthy relations with other nations of the world. 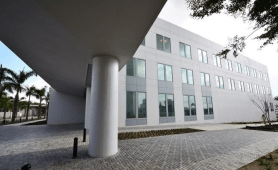 As a gesture of friendship and allegiance, the United Sates has dedicated its state of the art new Embassy Annex in Abuja, Nigeria. In addition to the Office Annex, the facility boasts a support annex, community accommodations, parking and US Marine Guards facilities. Apart from strengthening the friendship ties between the two countries, another motivation behind this project is to ensure that the employees are provided with a secure place so as to work without any concerns for their safety. The new edifice is quite remarkable in its architecture. The state of the art design features ensure resource conservation by making an efficient use of architectural and scientific techniques. From the use of LED lighting to contemporary plumbing fixtures which ensure water saving, the architecture of the new premises has been specially planned to lower the operational costs. This joint project of AECOM, Virginia and PAGE, Washington as unveiled by the US Under Secretary for management Patrick F. Kennedy in an elegant ceremony which was attended by US Ambassador to Nigeria as well as some locals. The remarkable feature of this $162 million structure is the fact that it embodies all the American values in itself. The building is a symbol of American culture and technology. It signifies not only the advancements that America has made in the fields of technology, science and engineering but also encompasses the core American values of culture, art, friendship and civilization. Thanks for this information. I had not read about this. But, I do believe its a smart move in establishing friendship and support from Nigeria. But, I do wonder about spending so much on the that building. I wonder, could we have spent half as much and used the other half for needs in Nigeria?